I read an interesting article on LinkedIn the other day titled, “The New Normal in Sales: Customer Dysfunction” by Nick Toman, a sales effectiveness professional. The gist is buying processes are increasing at an alarming rate, and it is the dysfunctionat the customer that drives this and “poor” sales outcomes. I thought about this for a while, and related it to my post, “We Appreciate Everyone Except Our Vendors, and It’s Killing Sales”. Toman’s article provides a perspective at the customer and the ailments killing sales. 2.5 years ago, the buyer group consisted of 5.4 stakeholders. Today, that number is 6.8 from 3.4 different functional areas. When you add heads into the buying process, there’s an expectation of a need to get consensus which, ironically, is the result of indecision due to more heads. Customers citing high amounts of dysfunction are 60% less likely to make an ambitious purchase (vs. lower dysfunction companies). This leads to customers buying very simple, bare minimum purchases to assuage the consensus. The average purchase decision takes 4.9 months while the average “no purchase” decision takes 4.7. There’s so much dysfunction that getting any type agreement (go or no-go) is virtually the same. No wonder prospects go radio silent before any feedback. A few keys then arise from these thoughts. First, be prepared for the long haul and the difficulty of today’s sales. Second, nail the value prop as quick as possible with a very specific target group. Third, reduce the consensus. Get the sale. Expand later. Remember, all it takes is one opponent (negative feedback) to derail a whole sale. What are your thoughts? What have you noticed in today’s sales? How would you address the challenges? 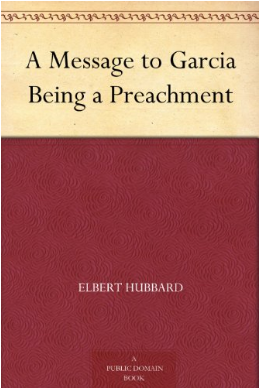 I recently finished Elbert Hubbard’s A Message to Garcia. It’s a quick 30-minute read. 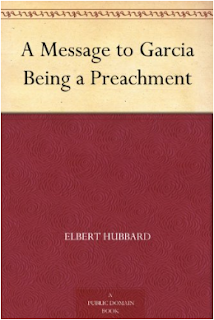 The book praises the result of a man named Rowan who was tasked by President McKinley to deliver a message to… well, a man named Garcia. This story occurs during the U.S.-Spain war in the late 1800s. Obviously, there was no cell phone, no email, or other rapid way to reach Garcia. In fact, Garcia was, at the time, buried in the forests of Cuba. Rowan was tasked to deliver this message with no other instruction or details as to Garcia’s whereabouts or how to communicate with him. It was a simple need. Rowan had anything but a simple task. However, he dutifully took McKinley’s message, and delivered to Garcia. This mini-book has been printed millions of times over, and has been used in business, in the military, everywhere. It’s message is clear – with no other instruction, does a mission get accomplished. There were no other details, and Rowan set out to accomplish said mission. There were no ifs, ands, or buts. There was no more information other than Garcia’s name and a rough interest as to who he was. That was it. Who on your team is Rowan? Are you the type to look for answers and study and review before even tryingto accomplish some task? Who is someone you can count on to just get the job done? Who can deliver the message to Garcia? Being a blogger (of many blogs), it makes sense many new and want-to-be bloggers reach out to me for advice. I’ve even recently launched another blog for another passion project. I’ve also helped at least a dozen start up sites. With each iteration, I’ve found my go-to recommendations on what to use. If you’re looking to start a website or a blog, these are my recommendations. Buying a domain – GoDaddyor Namecheap.Both are very simple. Go Daddy can offer as low as $2.99 for the first year of owning the domain with a 2-year commitment. The second and following years go up to $14.99. You can find domains on Namecheap for $10.69 annual (first, second, so forth). Website builder/ content management system (CMS) – WordPress. This blog (as of 03/09/17) is built with Blogger. It was real quick to get up and running several years ago when I started. However, Blogger lacks the power of flexibility and a strong theme ecosystem to customize like WordPress. The themes make your site stand out, and many can be incredibly easy to implement “WOW” elements. Hosting – Siteground.This is a new recommendation. I launched 100 Strangers, 100 Days with Digital Ocean. It was easy, but also had several hiccups. Plus, it’s expensive. I checked out Siteground, and found this to be WICKED easier. A few clicks, and you’re up. Simple, fast, and a fraction of the cost of other hosting services. WordPress Template – Enfold. This theme is very simple and hugely powerful. It’s drag-and-drop capabilities are superior to what I’ve found on other sites. Meanwhile, you can customize the heck out of your site with very simple UI. The team has done a great job of still playing nice with plug-ins for even greater flexibility. Also, they back up their work with great support. Just select a demo template from their packaged theme, and go from there. Simple. Emailer/ marketing – Mailchimp.It’s an Atlanta-based company bootstrapped from the start. Real quick to use this to capture emails, and notify your readers of updates. With the above, you can launch a site and have a simple landing page up in a couple hours. It could happen faster, but you’ll likely noodle over color schemes, pictures, and the like. Know that with this set-up, you can take your time or be quick. Drop me a note if you have questions.